This post marks the beginning of a new and exciting direction here at Wall Decor Source. When I started this blog, it was to share my love for anything that goes on a wall: wallpaper, unusual lamps, art, etc. But after a while, the scope of it started to feel a bit too constrained. There is so much fantastic design, crafts, ideas and products out there in all areas of decorating that I can’t resist sharing (I’ve been doing that to some extent on my personal blog, but juggling several blogs and a full time job is pretty tough when you’re only one person). So I decided it was time for WDS to expand beyond the walls. We’re not doing a total gut renovation; the old posts will still be there, but the new site will incorporate much more than wall decor. In the next few weeks, you’ll see a new name, logo and a slightly different look here, and I hope you will all enjoy the new WDS. I’m really excited about it and can’t wait to get started! Now, back to the inspiration retrospective as promised in the title. I am one of those people who can’t bring myself to tear pages out of magazines, and never, ever throw them away unless I have to (flooding in our basement sadly claimed a large number of really old ones last year). Every now and then I go back to look at what I earmarked years ago, both for new inspiration and also just to see what has stood the test of time. Sometimes it’s furniture, sometimes a room layout, and sometimes just a color scheme. 1. Not only is the dog adorable, but what a great idea for an old suitcase! 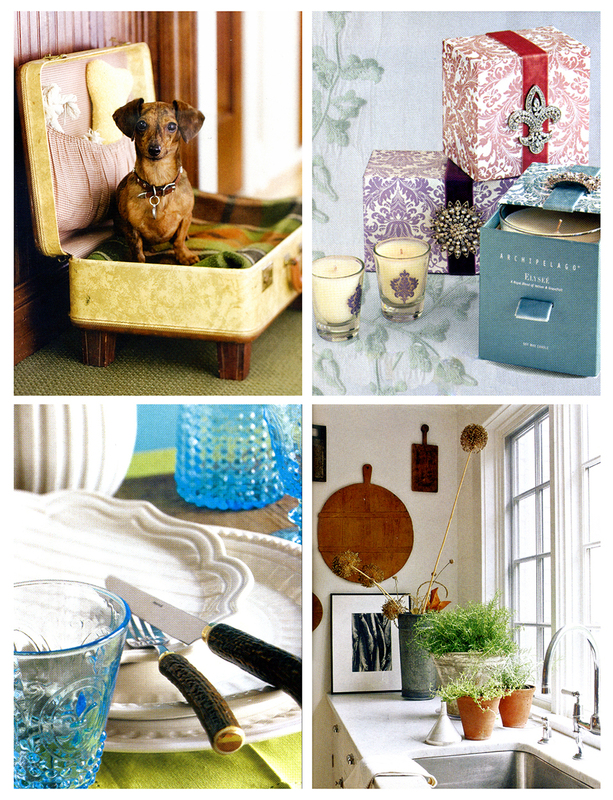 For more, see my Home Decorating Ideas Part 2 post.